Home / Blog • Headline / Marbella and more….. Yet again GS athletes were out there racing this weekend, and across Europe (we are still part of it!) they were all fighting the elements! Marbella with choppy seas and an exhausting wind, and I believe back in the UK they had silly low temperatures, wind and rain! So, lets start on the sunnier side! Sarah, Rob, Nige and myself made the trip out to Marbella to check out the mountain views on the bike course, and soak up a bit of vitamin D on the run course. It certainly didnt disappoint. Despite our practice swim on Friday being dead calm, saturday and sunday were quite different with a strong wind, dropping the temperature of the sea, and creating a fair few waves and chop. I would like to say that despite that we all nailed pbs for 1900m by some distance in the swim, actually, (despite not telling anyone) the swim was shortened to around 1600m according to Garmins!. For Sarah and Rob, this was their first 70.3 and open water experience, so tough conditions for their first one, but it did not deter them and Nige put in a great swim as well, despite his initial fears of not having swum enough recently. The bike course was spectacular (especially if you like climbing up mountains!) After a 5k flat stretch on the golden mile the bike course headed straight up a mountain, which consisted of a gradual twisty climb up, with stunning views across the landscape out to sea. Once at the top, a rolling descent with some strong cross winds took you to the turn around point, where you had another 8ish k gradual rolling climb. However the last 15k consisted of 10k down hill and 5k flat back to transition, so ideal to make up some time (….or not if your gear shifter breaks and you cannot use the big cog!) Rob, despite frequent stops from probably drinking most of the ocean put in a great bike split, (all in good shape for his TdF later)and a none to shabby half marathon despite an aggravating calf finishing in all the 5s. 5.55.55. 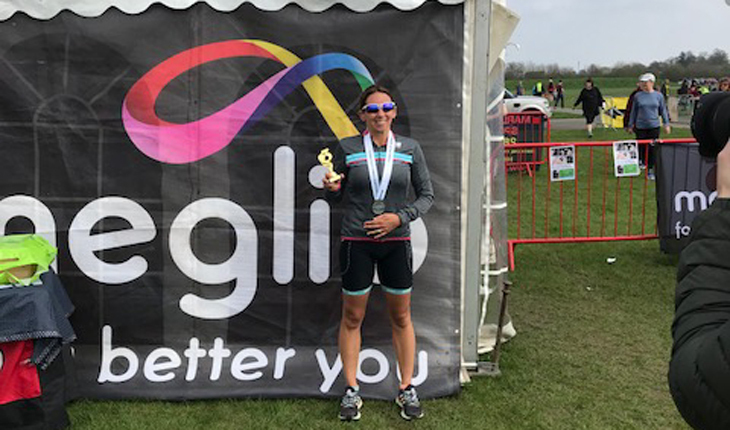 Sarah who had never climbed so high or far on a bike before, and had a stomach that was rebelling big time on the run, beat her target time by over half an hour and finished 14th in her AG overall, – and there is so much more to come there! Very exciting. Nige, also nailed all of his goals for the race, which is some performance this year, and finished strong – so more to come there as well – its only April! Liza also stepped up to the half marathon distance in the Big Cow having not run that distance for quite a while, coming home strong in 4th position in her AG. A great performance, and all boding well for the coming season, the next event being the postponed Mad March Triathlon. Rolling back a week or 2, a huge congratulations has to go to Leanne, who raced the week before at Standard Duathlon, posting a PB for her first 10km smashing the bike and finishing 3rd OVERALL! Then of course there was the London Marathon, which saw George posting a sub 2.55 run, in some warm conditions. Fantastic performances and a great way to start the season. It is of course only April, so lots more racing to come! In May we have athletes racing at the New Forest Triathlons, Essex Middle Distance, the Monster Mojo and ITU AG qualifiers so lots more to come. weekend round up of challenges!